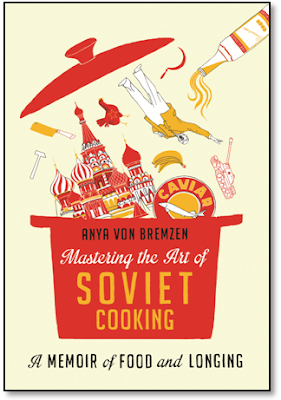 The subtitle "A Memoir of Food and Longing" so aptly conveys the heart and soul of Mastering the Art of Soviet Cooking (Crown Publishing, fall 2013), cookbook author Anya Von Bremzen's captivating new memoir of growing up in the Soviet Union, it almost seems unnecessary to tell you any more. Except that this is about the Soviet Union, which we Americans all know was a terrible, terrible place - flavorless food, oppressive rules, political indoctrination, infinite lines, and massive shortages - wasn't it? What could there be to want to cook? What could one possibly long for? Plenty, as it turns out. Von Bremzen's memoir might confirm all these things we learned about the former Soviet Union in our social studies classes and the news headlines of our childhoods, but also paints a far richer, intimate, and complex portrait of family, culture, nation and identity. 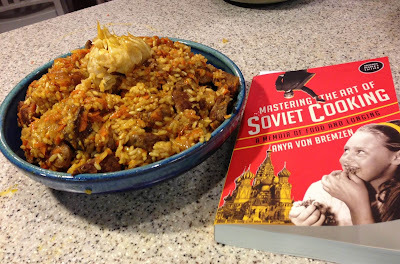 The author welcomes us into her family fold, transporting us back in time by cooking (with her mother) a series of dishes that represent the history of their family's life in the USSR. We follow the generations through the decades, their cuisine and way of life at any given time reflecting the leadership and ideology of the era, wars both hot and cold, changing circumstances and climates for Jewish citizens under Soviet authority, and political affinities and differences among her own family members. Anya's grandfather Naum, for example, was a loyal and highly ranked party intelligence officer. Though they, too, often faced hardship, his family often fared significantly better than that of average citizens. Naum's daughter (and Anya's mother), Larisa, however, was a child during the brutal deprivation of the war years and those following, and was terribly disenchanted with Communist practices and the daily struggle for spiritual and physical survival. Anya's own memories of the 1960s and early 1970s are relatively fond. Despite her mother's staunch and avowed rejection of shows of party loyalty, Anya harbored a secret, forbidden (by her mother) infatuation with Lenin and an enchantment with the songs and ceremonies that were part and parcel of the Soviet school experience. It was Larisa who made the wrenching decision for mother and daughter to emigrate to the United States in 1974. At the time they left, the separation was to be permanent, their family forever left behind: they would, at that time, have no right of return. Their departure also put the remaining family at great risk - Naum was lucky to have friends who were willing to protect him, to some extent, from the shame of his daughter's disloyalty; Larisa's estranged husband was not quite so lucky and lost his job. Von Bremzen's writing is conversational and engaging, wonderfully descriptive, and often extremely moving. Her clear devotion to her beloved (if complicated) mother Larisa is touching, and gives the book such warmth. She also recounts harsh political persecution and starvation in numbers that absolutely confound the brain, but her personal stories convey the human side in a way that mere numbers cannot. I was struck, too, by the profound sense of nostalgia for this place that had offered her family such a very difficult life in so many ways. Larisa and Anya's transition to America was not an easy one. Anya found herself overwhelmed by the American supermarket, achingly missing elements of the cuisine - tangy Soviet mayonnaise, hearty black bread, for example - and also quite lonely. The abundance and freedom of America was a great blessing, but at the cost of leaving so much behind. The book includes recipes for some of Anya and her mother's favorite dishes, each representing a decade beginning in the last days of czarist Russia through the early 21st century. They sound exotic and scrumptious: kulebiaka, palov, gefilte fish, and blinis among them. Notable, and in striking contrast, is the image of a ration card substituted in place of a recipe representing the 1940s - these were the war years. Malnutrition was universal, and starvation widespread. It is hard to comprehend that anyone did survive on so impossibly little. Notice the gorgeous, whole head of garlic garnishing the top. Cooking a palov in itself was an adventure - steaming rice atop an aromatic, simmering base of lamb, cumin, browned onions and carrot; nestling that entire head of garlic in the thick of it, flavoring the dish and caramelizing into sticky sweetness. The palov took me over two hours to complete and was worth every minute... it's maybe one of the most delicious meals I've ever made. The whole family loved it and over the course of two days we ate every last bit. When it was gone, we mourned. Food and longing, indeed. Happy reading - and cooking! I was delighted to receive a complimentary advance review copy of Mastering the Art of Soviet Cooking from the publisher. This sounds amazing/delicious! I love foody memoirs -- have you read The Language of Baklava? That's one that will make your mouth water, too! PS: turns out one of my add-on blockers was making it impossible for me to comment! Finally figured out how to turn it off for your blog so I'll be commenting again! This really does sound brilliant, I'm quite anxious to read it! I hope you enjoy it, Charlie, and I look forward to hearing your thoughts on it! Even though I usually dislike books about cooking, this book sounds fascinating. Thanks Ryan! There is lots about food and cooking, but it really is not just about food and cooking (and the recipes themselves only a few in the back of the book.) I think anyone with an interest in a more personal perspective on life in the Soviet Union would enjoy it. I've put this on my wish list! This was a great book and has stayed with me since I finished it. I think I'm going to try the Kulebiaka for Thanksgivingukkah. The pilav looks great! Thanks for visiting - thoughts welcome. Text and original photos on this site copyright: Books, Personally, 2011-2018. Powered by Blogger.